The reviews have been astonishing: Mamma Mia! Here We Go Again is, we’re told, a glorious piece of feelgood fun; moreover, it has the emotional heft to make us cry. We’re surprised: we’re ABBA fans (because the music is undeniably good, right?) but we both found the first film a sort of okay-watchable-quite-good-nothing-special kind of thing. So what makes it so much better this time? Sadly, the answer is… nothing. Nothing makes it better, because it isn’t better: it’s worse. It’s weirdly patchy: some genuinely awful sequences interspersed with lovely moments. All together, it’s a mess. Most of it (the prequel section) tells a back story we already know, fleshed out without revealing anything. There are no surprises here. The sequel section fares better, with the multi-talented Amanda Seyfried (Sophie) bringing a much-needed sincerity to proceedings, and wringing every ounce of emotion from the songs (One of Us, which she sings with her estranged husband, Sky (Dominic Cooper), is the highlight of the film for me). The prequel takes us back to 1979, when Donna (Lily James), freshly graduated from Oxford, unsure of what she wants from life, decides to seek adventure and takes herself off travelling. In Paris, she meets Harry (Hugh Skinner); charmed by his geeky naïvety, she spends the night with him before heading off alone to Greece. En route to the unnamed island idyll that claims her, she meets Stellan Skarsgård’s younger incarnation (Josh Dylan), but he’s off to take part in a boat race, and – while he’s gone – she falls for Sam (Jeremy Irvine), the Pierce Brosnan-a-like, who is absolutely perfect – except for the fiancée he forgets to tell her about. James is a charismatic performer, and her vocal skills are more than up to the challenge (which is more than can be said for poor Hugh Skinner, who has definitely been cast because he resembles Colin Firth, and not because he has any discernible musical ability). Her character is flighty and foolish, making literally no use of that Oxford degree, but she’s engaging and entertaining, and she makes us care about her. Not much happens in the sequel, which is a shame, because it has all the best songs and all the best actors. I mean, Sophie gets pregnant and feels close to her dead mother, and there’s a party that’s threatened by a storm, but that’s about it. True, Cher is a camp delight, appearing as Sophie’s errant grandmother and stealing the show, and Dancing Queen proves the perfect accompaniment to a lively, animated crowd scene. But honestly, that’s all there is. There are huge missteps too. I hate the graduation scene where Donna and her friends (Jessica Keenan Wynn and Alexa Davies) sing I Kissed the Teacher to a badly accented Celia Imrie (I think she’s supposed to be Scottish, but I can’t be sure). They’ve changed ‘he’ to ‘she’ in a bid to make the lyrics somehow more palatable, but I can’t see what difference it makes – it’s a good song, but the sentiment is undeniably creepy when filtered through a 2018 lens. It makes me most uncomfortable. Ach, I don’t know. It’s just a load of mawkish nonsense, unpalatably sentimental and as silly as can be. Thank you for the music, ABBA – but can we stop filming this fluff? It’s tempting to imagine the kind of think-tank meeting that might well have preceded this film. And so on. The inevitable effect, unfortunately, makes Finding Your Feet feel like a cynical exercise in box-ticking. Which is a shame, because there are some excellent actors in this, doing their level best to make it work. Sandra (Staunton) is the well-to-do wife of Mike (John Sessions), a former chief constable. Hosting his retirement party at their palatial home, she discovers that he’s been cheating on her for the past five years with Pamela (Josie Lawrence) and, understandably miffed, she packs her bags and heads off to the council estate home of her estranged sister, Biff (Imrie), who is what might be described in these circles as ‘a bit of a character.’ Sandra is understandably in a foul mood when she arrives, which goes some way to explain her general unpleasantness towards everyone she encounters, but not the scene in a Chinese restaurant where her attitude borders on out-and-out racism. Quite why Biff doesn’t send her packing is anybody’s guess. Meanwhile, Biff’s close friend, Charlie (Spall), lives on a barge and is currently watching in helpless dismay as his wife, Lilly (Sian Thomas), who has been consigned the the tender mercies of a nursing home, slips further and further into the grip of senile dementia. His first encounters with Sandra are not exactly cordial but, when Biff manages to persuade her sister to come along to the weekly dance class that Charlie also attends, he and Sandra have a quick spin out on the dance floor and, against all the odds, they start to enjoy each other’s company. What else do we need here? Oh yes, of course, let’s ship the whole cast off to an exotic location – in this case Rome – so they can participate in an international dance festival and where that new relationship can be allowed to blossom. Oh wait, there’s still one vital ingredient missing… oh yes, a terminal illness. Perfect! All this manages to yield not one single surprise in the telling, and you have to feel a little sorry for the actors who work their socks off to sell this tosh, but even they can’t quite convince us to actually care. I think what’s been overlooked is that The Exotic Marigold Hotel was a more heartfelt affair, with the heft of a Deborah Moggach novel behind it, and – even so – its success as a film most probably came as a pleasant surprise to everyone involved. Indeed, the attempted sequel was a pretty woeful affair as the makers attempted to replicate its charms. Viewers can easily tell the difference between a genuine story and a marketing exercise. With Finding Your Feet I simply cannot escape the feeling that behind all those light-hearted escapades lurks a mean-spirited attempt to part older viewers from their money – and try as I might, I can’t quite forgive it for that. In 2011, The Best Exotic Marigold Hotel made the cinema industry sit up and take notice. Here was a modestly budgeted film that raked in a hefty profit, but more significantly, it took it from the kind of mature audience that cinema usually fails to attract (i.e. not just 12 year old boys). So it was inevitable that sooner, rather than later, there’d be a sequel. And here it is, complete with a title that sounds worryingly like a self-fulfilling prophecy. It should be remembered that the original film was based on a rather good source novel by Deborah Moggach. This one appears to be an original screenplay, if by original, you mean borrowing an idea that famously appeared in an episode of Fawlty Towers. The kindest thing you can say about it, is that it’s a curate’s egg of a film, good in parts but those parts are few and far between. Sonny (Dev Patel) is soon to marry his fiancé, Sunaina (Tina Desai), but first he plans to expand his operation by opening a second hotel and at the film’s inception, has gone to America to seek finance. In this enterprise he’s aided by the caustic Mrs Donnelly (Maggie Smith) her character slightly diluted from her original bitchy incarnation, but nonetheless still awarded most of the funniest lines. Meanwhile the usual suspects from Marigold 1 parade around having affairs with each other (Celia Imrie’s character, Madge, appears to have turned into a borderline good time girl,) while Evelyn (Judy Dench) and Douglas (Bill Nighi) are still failing to connect, even when it’s perfectly clear that the two of them are simply made for each other. Into this hotbed of geriatric passion wanders Guy Chambers (Richard Gere) who might or might not, be the hotel inspector who can grant Sonny’s expansion plan. Before you can say, ‘Basil Fawlty,’ Guy has the hots for Sonny’s widowed mother and much (alleged) hilarity ensues. The problem is, that this is all so obvious, it might as well have been performed as a series of semaphore manoeuvres. A last minute ‘twist’ fails to offer any surprises whatsoever. And what’s happened to Sonny’s character? In Marigold 1, he was charming in a bumbling, hapless sort of way, but here he’s a car crash of a person who can’t open his mouth without offending everybody in the vicinity. On one hand, TSBEMH deserves respect for daring to portray senior citizens as genuine characters with real lives and real concerns; on the other hand, points must be deducted for its outdated portrayal of India as a country that has somehow never escaped the bonds of colonialism. The first film managed to skirt skilfully around these issues, but this time it just wades on in, seemingly without thinking. The climactic wedding features lots of dancing and larking about, but also comes with a large dollop of sentimentality, which once again, the first film was careful to avoid. So, second best by name and certainly second best by nature. Ideally, the film makers should have gratefully accepted their groundbreaking hit and moved on to another idea, but of course, the movie business will always respond to a hit by throwing more money in it’s general direction. Can we ‘look forward’ to The Third and Final Exotic Marigold Hotel? God, I hope not. Sometimes in cinema, you encounter a bit of fluff. And other times, you encounter double fluff with extra fluff and i suppose this is the file to which you would safely consign The Love Punch. 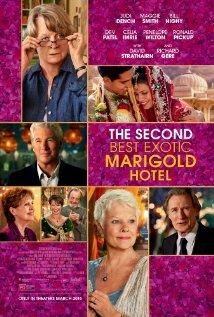 This light comedy featuring more mature actors than you’d normally expect to see in this kind of story was probably aimed at the same audience that The Exotic Marigold Hotel mined so effectively, but it’s nothing like as assured and it has to be said, it’s profoundly silly, to boot. Pierce Brosnan plays Richard, an affable chap who works for a multi-national company (in what capacity, we’re never entirely sure.) He’s divorced from Kate (Emma Thompson) with whom he maintain an affable friendship (cynics will mutter that we’re already straying into the realms of the unbelievable.) When the company is purchased by a ruthless asset-stripper, the pension scheme into which Richard and most of his staff have bought, (Kate too, as it happens) is rendered entirely worthless. The head asset-stripper decamps to Paris in order to get married and publicly purchases a ten million dollar diamond necklace for his beloved, whereupon Richard and Kate hatch a plan to pop across the channel and nick it (as you do.) 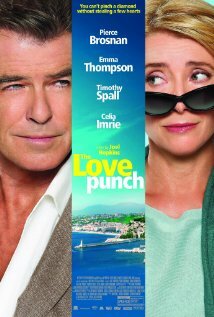 They also enlist the help of their plucky neighbours, Penelope and Timothy (Celia Imrie and Timothy Spall) and with a confidence that belies their humble origins, the foursome set off to take on the bad guys. The problem is, that the characters manage to assay their chosen mission with such aplomb everything seems faintly unbelievable. And more fatally, there’s never any real sense of danger, no fear that something might go wrong for them, even when Richard and Kate find themselves in the back of a van perched on the edge of a cliff. Obviously, the veteran actors all make the most of this meagre material and the film’s enough to pass an undemanding hour or so, but nothing more than that. This is perfunctory film-making at best. You’ll have forgotten the details before the credits have finished rolling. And will Richard and Kate get back together? Who cares?